There are various different wristbands to choose from when you’re organising an event. Considering different types of wristbands can help you cater each individual style to the event, helping it seem more professional or luxurious. We have come up with 5 different styles of wristbands to consider for your events. You can get these wristbands as custom printed merchandise and tailor them to your promotional needs. If you need something that is comfortable and perfect for events, vinyl wristbands are perfect. They are available in a host of colours and can be designed to cater to the needs of the events. There are those who want use plain designs, but with the non-reusable snap lock, perfect for festivals and nightclubs. Tyvek wristbands is an extremely popular wristband. 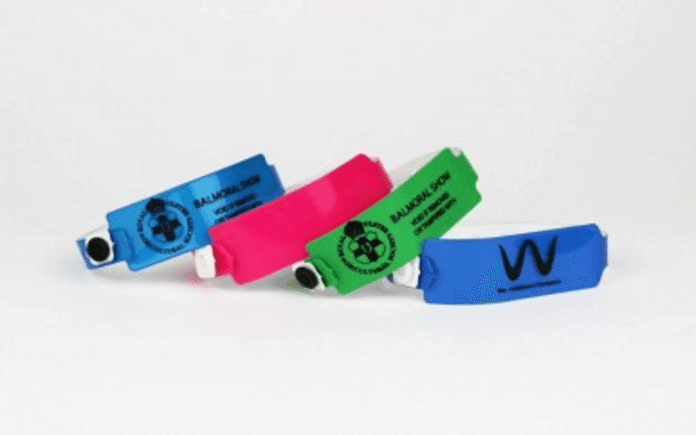 With another customisable design, Tyvek wristbands are another example of a nightclub wristband. The design and layout is simple, as they are made of polyethylene fibres with a tear resistant clasp. They are comfortable up to around 48, so don’t be leaving them on for too long. As the festival season is rapidly approaching, festival wristbands are ideal for those larger events. With a customisable design and a textured fabric, they really are there for a long run. With such a versatility you are able to get satin and customisable designs, which are beneficial for individual festivals. Not only are they great for festivals, but they can be used for promotional campaigns, helping increase the range! Silicone wristbands are one of the most popular for promotional and charity based events. They can be used for advertorials, promotions and help to raise awareness for different companies. Not only are the durable, but they can be embossed, printed and changed with a personal design. Available in a host of colours, you should really consider silicone wristbands for any charity events. The final wristband on the list is the silk screen are the most perfect options for involving brands or designs. If you need something that is funky, fun and versatile silk screened wristbands are exactly what you need! Perfect for children’s parties, take advantage of them.